It’s difficult to call a guitarist who routinely shows up in the upper reaches of “100 Greatest Guitarists Ever” lists underappreciated, and yet the first impression the towering seven-disc box set Skydog: The Duane Allman Retrospective makes is that Duane Allman does not receive his proper due. Sure, the Allman Brothers Band are one of the staples of classic rock, a band that carved out the blues-drenched sound of Southern rock while also establishing a template for jam bands to come, and Duane’s contributions were crucial in making Layla & Other Assorted Love Songs Eric Clapton’s finest moment, and that would be enough for a substantial legacy even if Allman hadn’t died in a tragic motorcycle accident at the age of 24, but that was only part of the story. The rest is told on Skydog, a box set that has its origins on a collection Bill Levenson began in the early ’90s, just after he compiled the four-disc Allman Brothers Band box, Dreams, in 1989, which didn’t see fruition until 2013, after years of work by the renowned rock & roll archivist and Galadrielle Allman, Duane’s daughter. Both had their reasons for delivering a testament to everything Duane Allman achieved in his short life, and that dedication pays off wildly on Skydog, as great a box set as has ever been released. Much of the greatness in Skydog lies in its thoroughness, how it treats Allman’s work outside of the Allman Brothers Band not as a digression but rather a focus. The Allman Brothers Band account for just 21 of the 129 songs here, not popping up until toward the end of disc three, by which time Duane has been heard playing gangly R&B guitar in his teenage R&B band the Escorts, expertly mimicking the Yardbirds in the Allman Joys, marrying psychedelia and blues in the Hour Glass, essaying an early version of “Melissa” in the 31st of February, and, especially, making himself heard on sessions for Clarence Carter, Wilson Pickett, Laura Lee, King Curtis, and Arthur Conley recorded down in Muscle Shoals, Alabama (sessions with Aretha Franklin were cut up in New York). He’d also traded solos with Otis Rush and blazed a trail on Boz Scaggs’ eponymous 1969 LP, sessions that emphasized how his guitar was getting increasingly gutsy and gritty, characteristics that could be heard on the Allman Brothers Band’s 1969 debut. Positioned as it is here, the first Allmans album is not the start of something, but rather a pivotal point in a long journey that continued to unfold long afterward. On-stage, the Allmans improvised with imaginative ferocity, and the back half of Skydog showcases a restless, fearless musician, one who was eager to tangle with his idol Eric Clapton in Derek & the Dominos, rush on-stage with the Grateful Dead, guest with Delaney & Bonnie, and sit in with jazz flautist Herbie Mann. By the end of the set, Duane Allman seems to have had his hand in every kind of music being made in America at the turn of the ’60s, and the depth and scope of his achievement is staggering, especially when you consider that so much of this was recorded in a mere four years. While the records released by the Allman Brothers Band do hint at this range, Skydog tells a story unheard on any other Allman-related albums, including the excellent 1989 box Dreams. This is an epic narrative illustrating how soul, blues, country, psychedelia, jazz, and garage rock melded into modern rock & roll and, in turn, this is a biography of a musician who was instrumental in that evolution, a guitarist whose name is well-known but whose work is still not thoroughly appreciated. Skydog rights that wrong in glorious fashion. Even if he’d never formed the Allman Brothers Band, Duane Allman would be a major figure in American popular music. Long before his name became known to mainstream audiences, he had already established his credentials as a once-in-a-lifetime guitar visionary, leaving his unmistakable stamp on a broad array of recordings. 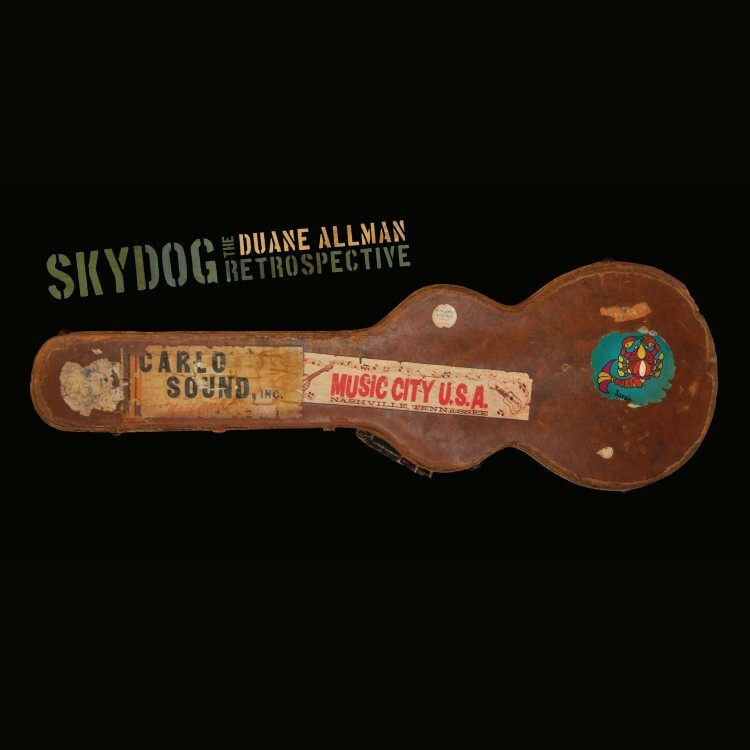 Rounder Records, a division of Concord Music Group, will release the most ambitious retrospective of Allman’s short but influential career titled Skydog: The Duane Allman Retrospective.